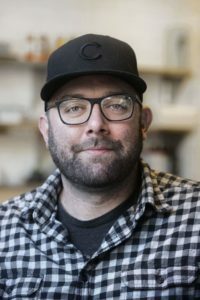 Andrew McCabe is executive chef and partner at the newly opened bar Vetti restaurant in Louisville, Kentucky, an all-day neighborhood Italian spot featuring housemade pasta, brick oven pizza and an ever-changing menu of shared plates. McCabe’s cooking embraces the Italian ethos of simple and seasonal while demonstrating the technical expertise honed throughout his diverse culinary career. McCabe launched his career in Louisville and then moved to Chicago where he worked at two Michelin-starred restaurants, Blackbird and the now-shuttered L2O. When an opportunity came up to return to Louisville to help open the hyper-local Harvest restaurant, McCabe jumped at the opportunity. During his time there he became immersed in local sustainable agriculture and formed relationships with farmers and producers. McCabe also worked at Proof on Main at 21c Museum Hotel, where he was named an Eater Young Gun semifinalist. He partnered with chef and founder of HiCotton Hospitality, Ryan Rogers, on the opening of bar Vetti.